Here’s the third recap from The Shadows Took Shape exhibition. 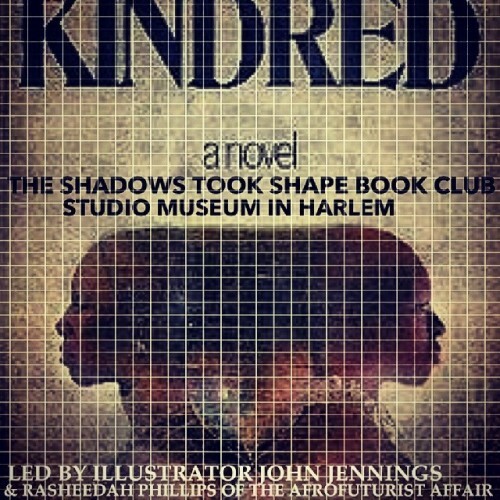 Today, I am sharing the notes and questions (some thoughts came after the club) from the book club for Octavia Butler’s Kindred with moderators Rasheedah Phillips of The Afrofuturist Affair and artist John Jennings. *The mechanics of the the machine: Who is controlling the time machine: Rufus, Dana or some outside third party? Is it an another ancestor or the books? Does Dana have a choice in going back; does she need to save Rufus, her ancestor? Who is more reliant on who to survive? How does the fear of death connect to a want of freedom as a kind of control button for returning from another time? How does Alice’s death figure into the conversation of death and agency? *The grandfather paradox works on a sense of linear time, but Kindred seems to subvert the idea. Is it creating alternative realities or futures? Is it based on another construction of time, like Foucault’s “heterotopia of time“? How does African diasporic views of time, which tend to be cyclical and terms like sankofa, sasha, and zamani, fir into the discussion of Kindred? How is the book a dialogue between the and and future, recreating the present? Dana seems to influence the past in some ways and the past influences her relationship with Kevin. How does this apply to how we construct memory, whether cultural, personal, ancestral, or universal. How does Dana and Kevin remember memories from both the 20th century and the 19th century? *How does the book make us rethink family and ancestry? We are told to honor the ancestors, but not all of our ancestors are honorable. How do we accept all of the people who came together to make us, no matter how painful? Would we save a character like Rufus, even at our own possible non-existence? What does the book reveal about moral relativity, and the complex web of family and slavery? Would we want to go back and change the past? Do we need it to survive as we are or would we want to create another future? *Body as technology: Dana’s body is her own time machine, and her husband Kevin also relies on her to travel back and forth. How does this relate to diasporic spirit possession ritual, like in Vodou? How does her body as a time machine reveal the dimensions of her relationship with Kevin? Kevin wanted her to be his transcriber, but with her arm gone (is that her writing hand? ), is Kevin now hers, writing the story of Kindred? Where is her arm now? Could someone use it to time travel to her? Does she have a loss of agency as a writer losing her arm? How does her missing arm, memory and writing her story relate to Nathaniel Mackey’s “phantom limb” concept, the invisible past haunting us and pulling us back like a chain, but also a “felt recovery” of the past? *Part of the framework of Afrofuturism is to see everything in our physical world as technology, thus the black body is a soft machine. Blackness is an artifact or by-product of racial construction and a re-inherited, remixed construct over time. The body is also read as text, or a palimpsest that is rewritten over and over again in different spaces of time. Stereotypes are mass-reproduced readings of people, based on the printing plate. *The film Brother from Another Planet has the alien character read as a black man in America, but he also communicates with and through technology. *How are black bodies read? One book by Mark Anthony Neal, Looking for Leroy: Illegible Black Maculinities, analyzes the reading of black male bodies. Another is Katherine McKittrick’s Demonic Grounds: Black Women And The Cartographies Of Struggle. * But there is also an agency in writing, like Dana telling her story. *In regards to time travel, Lisa Woolfork wrote Embodying American Slavery inn Contemporary Culture. From Star Trek, Avery Brooks directed an episode, Far Beyond the Stars, that warped time and reality. *The South can be seen as a haunting gothic space. Since part of Kindred takes place in Maryland, Jennings sees Kindred as an “ethno-gothic” work. “Ethno-gothic” has several elements: dopplegangers (double consciousness, the shadow taking shape, what happens when the shadow get agency), anti-heroes (ex. Rufus), false histories, the black body as grotesque, tensions with the past, present and future, magic and supernatural, and torture and abuse of body.